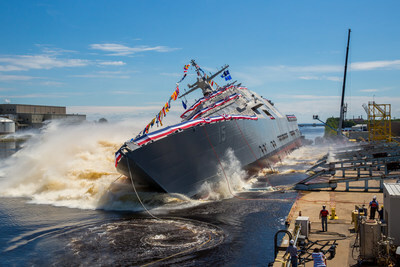 MARINETTE, Wis., July 1, 2017 /PRNewswire/ -- The Lockheed Martin (NYSE: LMT)-led industry team launched the 15th Littoral Combat Ship (LCS) into the Menominee River at the Fincantieri Marinette Marine shipyard on July 1. 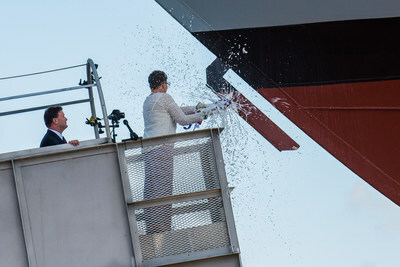 Ship sponsor Sharla D. Tester christened LCS 15, the future USS Billings, in Navy tradition by breaking a champagne bottle across the ship's bow just prior to the launch. "As a lifelong Montanan, there is no greater honor than to serve as the sponsor of the future USS Billings and to help bring this magnificent warship one step closer to joining the fleet," Tester said. "I know the people of Billings - and all Montanans - look forward to supporting Billings and her future crews for decades to come." Named in honor of the patriotic and hardworking citizens of Billings, LCS 15 will be the first U.S. Navy ship to bear the name of Montana's largest city. She will undergo additional outfitting and testing at Fincantieri Marinette Marine before her anticipated delivery next year. "The Freedom-variant LCS plays a critical role in the U.S. Navy's fleet, and we are committed to getting Billings and her highly capable sister ships into combatant commanders' hands as quickly as possible," said Joe North, vice president of Littoral Ships and Systems. "These flexible ships will help the Navy achieve its goals of growing the fleet rapidly and affordably." The Lockheed Martin-led industry team is currently in full-rate production of the Freedom-variant of the LCS, and has delivered four ships to the U.S. Navy to date. The future USS Billings is one of eight ships in various stages of construction at Fincantieri Marinette Marine, with one more in long-lead production. "We are proud to be building the USS Billings and her sister ships at the heartland's only naval shipyard," said Jan Allman, Fincantieri Marinette Marine president and CEO. "Today's launch and christening is a testament to the hard work of the more than 2,500 Michigan and Wisconsin workers who pass through the shipyard's gates, put on their hard hats and build American warships." The Lockheed Martin-led LCS team is comprised of shipbuilder Fincantieri Marinette Marine, naval architect Gibbs & Cox, and more than 800 suppliers in 42 states. Costing less than a third of a brand new Arleigh Burke-class destroyer, the Littoral Combat Ship is the Navy's most affordable surface combatant shipbuilding program and the ideal platform to grow the U.S. Navy fleet quickly and affordably. The Freedom-variant's steel monohull design is based on a proven, resilient design recognized for its stability and reliability. Founded in 1942, Fincantieri Marinette Marine (FMM) is located on the Menominee River flowage into Green Bay. The largest shipyard in the Midwest, FMM has delivered more than 1,300 vessels to the U.S. Navy, U.S. Coast Guard, and commercial customers, including the technologically advanced Littoral Combat Ship Freedom variant for the U.S. Navy. In 2008, FMM along with several sister shipyards also based in the Great Lakes region, became part of Fincantieri, one of the world's largest shipbuilding groups and number one by diversification and innovation, with almost 21,000 employees, of whom approximately 7,700 in Italy, 21 shipyards in 4 continents. Fincantieri operates in the United States through its subsidiary Fincantieri Marine Group, serving both civilian and government customers. Over the past five years, Fincantieri invested more than $100 million in both capital infrastructure and its resources to support FMM's transformation into what is now one of the best shipyards in the United States. Employing approximately 1,500 employees, today FMM is a state-of-the-art, full service new construction shipyard.